Most of us have grown up with an image of milk as wholesome natural and nutritious. So it often comes as a surprise to parents when their child develops a dairy allergy. This is particularly true as we are so dependent on dairy products to feed our children when they’re very young. But remember, human babies are designed to drink human milk, so it’s not necessarily that surprising that not everybody can tolerate other forms of dairy produce. So, don’t panic. Even though many parents worry about nutritional deficiencies caused by avoiding milk, cheese and yoghurt, there’s plenty that you can do to manage the problem and have a thriving, healthy child. Keep in mind that humans only started eating dairy products about 10,000 years ago – that’s just the day before yesterday in evolutionary terms – so we may still be adjusting to this type of food. The symptoms of dairy allergy can vary widely. The list of problems that can be linked to dairy allergy or intolerance includes diarrhoea, eczema, flatulence, bloating, catarrh, asthma attacks and constipation, amongst others. Of course, all these symptoms can also have other causes – possibly other allergies or simply signs of illness. Why Do Children Develop A Dairy Allergy? Dairy allergy is a reaction to milk sugars and proteins. If a new mum has milk and cheese in her diet, it’s possible that her breast-feeding child can become sensitive to milk protein at that time. Which Children Are Most At Risk Of Dairy Allergy? If one or both parents have allergies, their baby is much more likely to inherit the condition. New born babies with a family history of allergy should, if possible, be breastfed in order to give their immune systems the best chance of resisting allergy. If you must bottle feed, talk to your doctor about which baby formula is right for your child. For many children, just cutting back on dairy products will get rid of their symptoms. Butter is often well tolerated as it’s almost 100% fat, and many children can digest yoghurt because of the action of the bacteria on the troublesome milk sugars and proteins. But sometimes, a child’s allergy might be so severe that all dairy products have to be avoided at all times. If this is the case, just avoiding milk and cheese won’t be enough. Make yourself familiar with the wide variety of names for milk and milk products that might appear on the back of packets in your kitchen. Lactic acid, lactose, whey, ghee, lactobacillus, buttermilk, casein and caseinate are a few. Of course, don’t forget all the different types of dairy products such as crème fraiche, cream and yoghurt and make sure there are no dairy products in your margarine – read, read, read those labels. Lactose intolerance is a different thing from a dairy allergy. Lactose is milk sugar and some children lack the necessary enzyme, lactase, to digest it. That means the milk sugar is left fermenting in the gut leading to bloating and painful trapped wind. 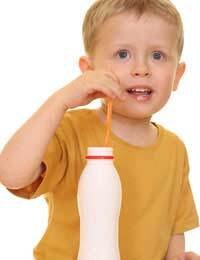 If your child is lactose intolerant you should not give them milk, especially skimmed milk which has the most lactose. Try giving them calcium enriched soya milk instead. Parents often worry about whether or not their dairy allergic child will get enough calcium. But take into account that calcium is used by the body with magnesium, and although dairy products contain calcium they have only tiny amounts of magnesium. That means that while we might take in a lot of calcium from dairy products, we don’t necessarily use it for bone and tooth health unless it’s balanced by magnesium. In fact, the foods that give the best combination of calcium and magnesium together are leafy vegetables like cabbage, spinach, sprouts and broccoli. You’ll also find plenty of calcium and magnesium in nuts, sunflower seeds, pumpkin seeds and pine nuts. Many parents believe that their children grow out of milk allergies. This might be the case, or it might just be that our bodies learn to adapt as our immune systems grow stronger. Even if your toddler seems to have grown out of their dairy allergy, it’s still a good idea to keep their intake of cows’ milk low to reduce the risk of further allergic reactions. If your child shows signs of dairy allergy, talk to your doctor about how to manage it. Don’t panic about lost nutrients and calcium deficiency. Instead, read up on the facts and consider all the different ways that you can ensure your child grows up fit, healthy and strong, without the need for dairy. But, as with any allergy, don’t try to diagnose the problem yourself. Talk to the health professionals about any symptoms your child displays.